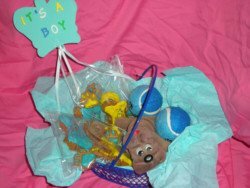 Make a diy puppy gift basket for someone who just got a new male puppy! Very easy to do with simple materials you can purchase at your favorite craft store. Include our ideas or put in the latest dog toys as new toys are constantly being developed and brought into the marketplace. A basket in blue. This basket is a blue colored mesh basket with a handle. Baskets like these can be found at discount stores like dollar stores so you are not paying a retail price for a basket. 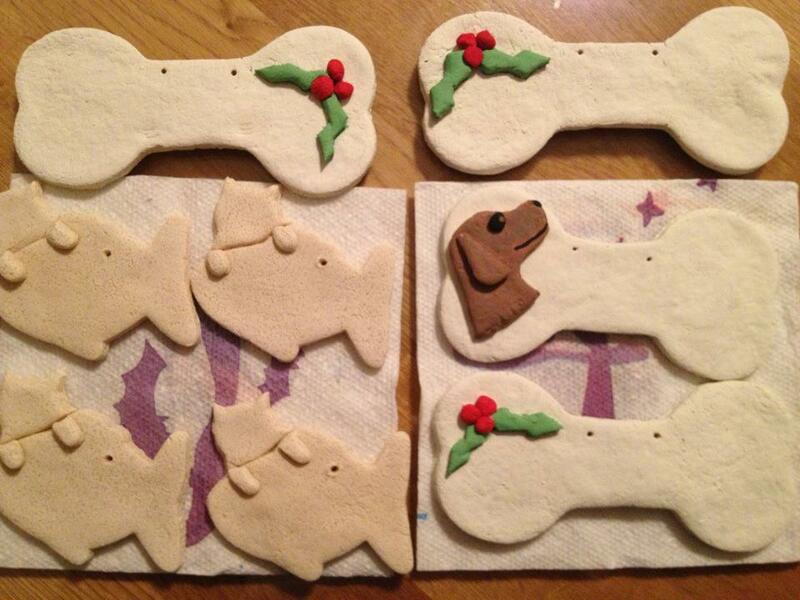 Homemade dog treats decorated in blues, yellows, browns as shown here. Green colors, purple, and white are appropriate colors for a boy dog as well. Tissue paper in a blue color, or other "male" color and pattern. Blue tennis balls for dogs - or any other color dog-friendly tennis balls. These are sold in pet supplies and are made of different materials than regular tennis balls because dogs will chew them and tear off the fuzzy covering. Regular tennis balls are not considered safe dog toys because the covering materials are not made specifically for dogs. Felt sign and sticky felt letters to read, "It's A Boy"
Put the dog treats into plastic bags to prevent crumbs from dropping into the basket and spilling out on your recipient's floor or rug. Arrange the tissue paper in the basket. 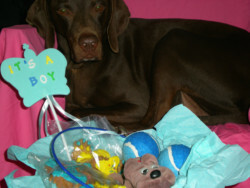 Place the treats and dog toys into the basket in a way so that all the items can be visualized. If you want to add a humorous touch, put in some chocolate cigars that say, "It's A Boy" for the new pet owners, or other boy baby items.